This webinar will provide an overview on how the CCRI can be implemented, tracked and measured within Naviance. 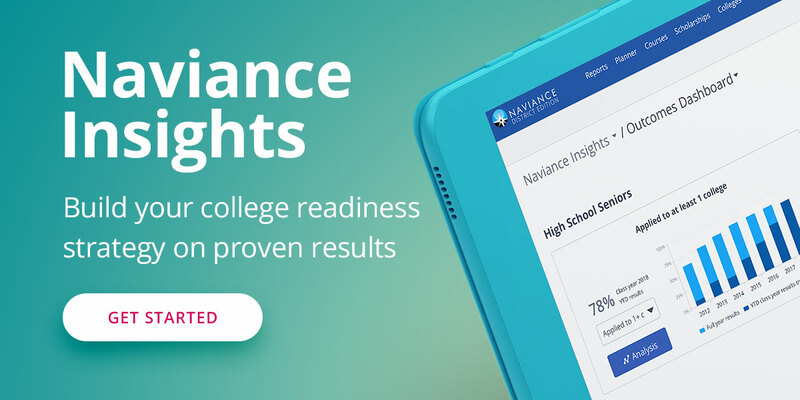 We will share best practices for current Naviance users as well as those looking into using Naviance in their school or district. Join a live presentation from two district leaders who have achieved dramatic results in helping first-generation college-going students transition to college. Join us as we highlight best practices from schools and districts who are showing measurable increases in FAFSA submissions and who are taking innovative approaches to working with students and families to decrease barriers to get students to college. Join Dr. Dave Schuler, superintendent of High School District 214, as he discusses the value of fostering future-ready students as a district-wide initiative, including creating buy-in at the district and school leadership levels, instilling milestones for students to measure readiness success, and measuring effectiveness of outcomes beyond high school graduation.